Until the recent wonderful Midnight in Paris from film auteur Woody Allen the perceived wisdom was that he was passed his best just living on his past and rehashing the scenarios from his wonderful earliest films. For me, I have always enjoyed every new Woody Allen film while accepting sadly that they have never been – until this latest one – the equal of Play It Again Sam or Annie Hall. What has this got to do with anything? Well, I am beginning to feel the same way about Richard Jones. His Ring at Covent Garden and Hansel and Gretel for Welsh National Opera live long in my memory but with, for instance, Lady Macbeth of Mtsensk, Die Meistersinger von Nürnberg and now this – The Tales of Hoffmann, certain elements of the mis en scène are becoming over-familiar; wardrobes and wallpapered rooms are just two – of a number of – recurring visual elements. This is perhaps a subject for debate but not here and I need to concentrate more on what he did with his Munich Hoffmann that has arrived at the London Coliseum. Offenbach creates a number of issues for a director as he never lived to see his opera performed. He died four months before its première, but after completing the piano score and orchestrating the Prologue and Act I. As a result, different editions of the opera soon emerged, some bearing little resemblance to the authentic work. The version performed at the opera’s première was by Ernest Guiraud, who completed Offenbach’s scoring and wrote recitatives for the spoken dialogue in the original score. Over the years new editions have continued to appear trying to push the work towards ‘authenticity’. However, often as with English National Opera, we get some extra music not by Offenbach: this includes ‘Scintille, diamant’ (‘My diamond, how it shines’) in Tim Hopkins’ modern translation), the tune of which comes from the overture to Offenbach’s operetta A Journey to the Moon and a Sextet (sometimes called Septet, involving the chorus as a character). We got the former but not the latter. It really would have been good to have a comparative analysis of Michael Kaye and Jean-Christophe Keck’s musical edition that was used somewhere in the printed programme. Another matter that creates much debate is the sequence of the acts. Apart from a Prologue and Epilogue, there are three acts telling different stories from Hoffmann’s life. They are basically independent (though Olympia is mentioned in the Antonia Act) and can easily be swapped without affecting the overall story. Offenbach’s order – as with ENO – was Prologue–Olympia–Antonia–Giulietta–Epilogue, but often in the last century, Giulietta’s act occurred before Antonia’s, and only recently has the original order been restored. 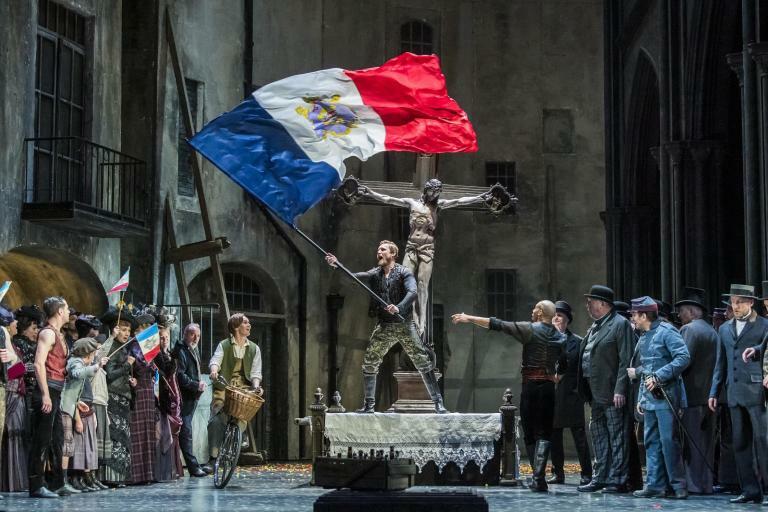 In my humble opinion, a staging of Hoffmann such as this one cannot make the case more strongly that the musically and dramatically more accomplished Antonia act should come third. Richard Jones’s Giulietta act had a muddled ending that rushed headlong into a gathering of all the characters with the Epilogue. Jones’s Hoffmann obviously needs a drink to forget his disastrous love life and (along with three constant companions) appears to need to smoke some ‘wacky-baccy’ to alleviate his depression about how it could all go so wrong time after time. A long clay pipe features on the front cloth to cleverly announce each act but it would be wrong to give the game away as to how this is done. The whole opera is set in various representations of Hoffmann’s one room flat with – in Giles Cadle‘s often expressionistic sets – a different decor for each act. Probably everything we are seeing represents just Hoffmann’s hallucinations – so much so that in the end all those characters from the opera disappear back through the drinks cabinet – presumably back into the bottles that brought them ‘life’. After all the first words we hear are ‘In vino veritas’! Nicklausse is a doppelganger for the poet himself, and first emerges from that cupboard in short trousers and indicates that what inspires Hoffman also arises from childhood memories – again a very familiar Leitmotif in much of Richard Jones’s work. Hoffmann, now also in short trousers, encounters Olympia, as a Cindy doll, at a grotesque birthday party for a small child. Cochenille, an assistant, is in drag (another familiar Richard Jones moment). We seem to enter Edgar Allan Poe territory for the Antonia act, it is all rather dark and gothic and she is haunted and wan. There is a gold disc on the wall to remind her of her singer mother and an old-fashioned record player to play her recordings. Simon Butteriss, who was Cochenille, returned as an eye-catching Frantz, Crespel’s servant. He clearly seems to be challenging his inner Charles Hawtrey of Carry On films fame. Finally Giulietta is a hard-hearted call girl – with a touch of Amy Winehouse about her -who gathers souls for her pimp Dappertutto. This involves an oversized shaving mirror that revolves to peels off the faces of her victims so they can be kept in jars. Perhaps it was this huge mirror that caused the technical difficulties that delayed the start of Act III? The London Coliseum audience was easily pleased by the appearance of someone in a gorilla suit who crossed the stage before this act. If the gorilla had gone on to do something – ravish Giulietta for instance – then there might have been a point for this but it just wandered about. For the Epilogue we were back in the flat as in the Prologue but now the walls are covered in Hoffmann’s drawings. It all seemed to peter out (again not unusual for a Richard Jones production), we have Nicklaus’s aria, Hoffmann passes out and that’s that. It is several years since The Tales of Hoffmann has been put on by ENO. There was a short-lived production by Graham Vick that replaced the old one I saw (how time flies!) in the late 1970s. I have always loved Covent Garden’s long running John Schlesinger production that has resolutely eschewed any textual or musical innovation and still seems to work, possibly better than this new version. Coincidentally, a typical intense Rolando Villazón (in his prime) is the finest Hoffmann I have heard and he was Richard Jones’s Hoffmann in Munich last year. Personally, I have always preferred the approach to Hoffmann to be more Germanic and heavier, than lighter and French. What I can say is this performance was the finest evening of singing I have probably heard at the London Coliseum this century and probably for a few more years before that. While suggesting his staging was not as interesting as I had hope for, perhaps Richard Jones can be credited for inspiring his cast to such vocal (and often equally dramatic) heights. Clive Bayley is a name that never before meant much to me but I cannot believe he has given a finer performance than he did of the four villains (Lindorf, Coppelius, Miracle and Dapertutto), making each one so different that it sometime seemed as though they were portrayed by different singers. From top to bottom of his voice he sang quite magnificently and without a hint of strain. The soprano, Georgia Jarman, someone completely new to me, was also a revelation – while not perfect in any act you will go far to hear her roles (Stella, Olympia, Antonia and Giulietta) better sung by one person. She had the range, power and flexibility to meet all the challenges; perfectly capable of the coloratura in Act I, she was musical and affecting in Act II. Jarman was more non-descript in Act III and though still fine again it was probably more the fault of Richard Jones’s indifferent staging here … or the version of the role she was singing. Christine Rice was outstanding as Nicklausse; she was totally engaging throughout and had a signature twirl of a conker on a string. Her experience of Hansel makes her all-too-believably boyish but her rich tones are undoubtedly those of one of this country’s finest mezzo. In a lesser ensemble Rice might have dominated the proceedings. As hinted at earlier in this review, Simon Butteriss announced himself as a character tenor of great promise in his multiple roles; there was a hint of Graham Clark about him and that is high praise from me. The even smaller roles were all cast from strength, notably; Iain Paton (Spalanzani), Graeme Danby (Luther, the innkeeper, and Crespel, Antonia’s father), and Catherine Young (Antonia’s mother). As Hoffmann, Barry Banks acted plausibly and showed that what I previously thought was a light tenor voice has gained some open-throated heroic qualities. He easily sang through the orchestra even at its loudest and was lyrical and tireless from the beginning of the long evening until his last note. The ENO orchestra, on impeccable form, was conducted by Antony Walker (US-based, though Australian born) with verve and strength. It was a long evening made longer by the technical hitch and though the Prologue dragged a little, once it all got going this recitative version of the opera seemed to fly by and cannot only get better as the run of performances proceed. Musically, I would have preferred the orchestra to sound a little grander and more sumptuous but you cannot have everything and the evening – from this point of view – was good enough as it was. The Tales of Hoffman continues in repertory at the London Coliseum until 10th March – for further details please see http://www.eno.org/home.php.